Walking down the South King Street hill today, I surprised this little guy by suddenly emerging from behind a fat sugar maple. He didn't react as most squirrels do. Instead of ducking around the other side of the tree, he lingered a moment to watch me take out my camera and shoot him. 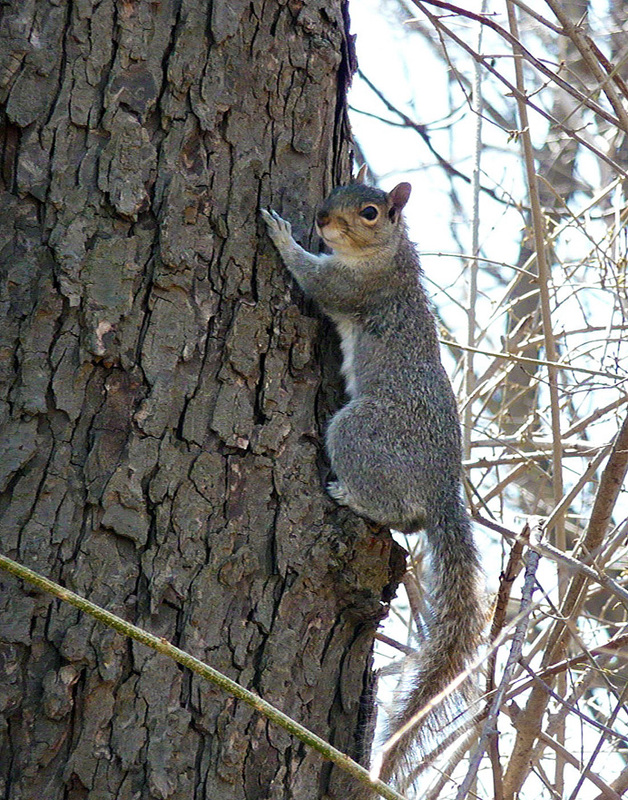 If you've ever circled a tree after a squirrel, you know they have an uncanny ability to keep the trunk between themselves and you. As a boy hunting with my father in the mountains of Pennsylvania, I learned to defeat this behavior by hanging my hat on a sapling, then tiptoeing to the other side. Squirrels aren't smart enough to realize that a red plaid Woolrich hat is not a man carrying a 16-gauge shotgun. If you aim at their height, they'll often emerge directly under your sights. Yes, I ate squirrels. My father had seven mouths to feed on a postman's salary. I can still remember picking the shot out of the meat. I bit into a BB now and then, and probably swallowed a few. Since they were made of lead in those days, they probably lowered my IQ. But not enough to make me as dumb as a squirrel.